Kathleen Kelley Young never expected to end up in Cloverdale, but she’s found herself fully immersed in the town, with a bustling inn and a brand new tasting room, supporting her Kelley & Young label wines. “This is really the official first day of opening here in the tasting room,” Young said Friday, as she gestured to her new Kelley and Young tasting room on Cloverdale Boulevard, her terrier Rudy trotting at her heels. Kelly & Young started as a label in 2005 after an excess of Sauvignon Blanc grapes landed in her lap. She and her husband worked for her husband’s father, the famed prune-farmer-turned-vintner Robert Young, and they had an excess of grapes that year. Kelley and Young still buys all of their grapes from the family, and Kelley Young’s husband Jim Young does double duty as the winemaker for Kelley & Young and the grape grower for Robert Young Estate Winery, founded by his father. Kelley Young says the Kelley & Young wine philosophy is based on the notion that wine is part of a good meal. “Our wine philosophy is wine has to go with food — it’s a food component. My first love is food, so for me it’s about the food. My husband, on the other hand came to it through the vineyard, so it has to be a well-balanced grape and wine,” she said. “We’re coming from two directions and we always say it’s a marriage of two passions, his for grapes and wine and mine for food, and so all of our wines are very well balanced and very food friendly,” she said. “A perfect example is our sauvignon blanc. Most sauvignon blancs are a New Zealand style and they are served very cold and are so tart. Trying to pair that with food is almost impossible. Unless you are serving filet of sole with a lemon beurre blanc sauce, nothing goes with that wine. But ours is a fumé style, more south of France, Bordeaux and very food friendly. You can drink this wine with anything, because it’s not super acidic it’s got a creamy quality to it. Our rosé same thing, very well balanced, it doesn’t have any elbows or knees that stick out in it. It’s got a wide range of foods it will go with,” she finished. In 2015, longtime wine club members who owned the Vintage Towers bed and breakfast in Cloverdale called to cancel their membership as they were moving to New Zealand. They had received an offer for the inn from someone in San Diego, but the potential owner planned to convert it back into a private home. 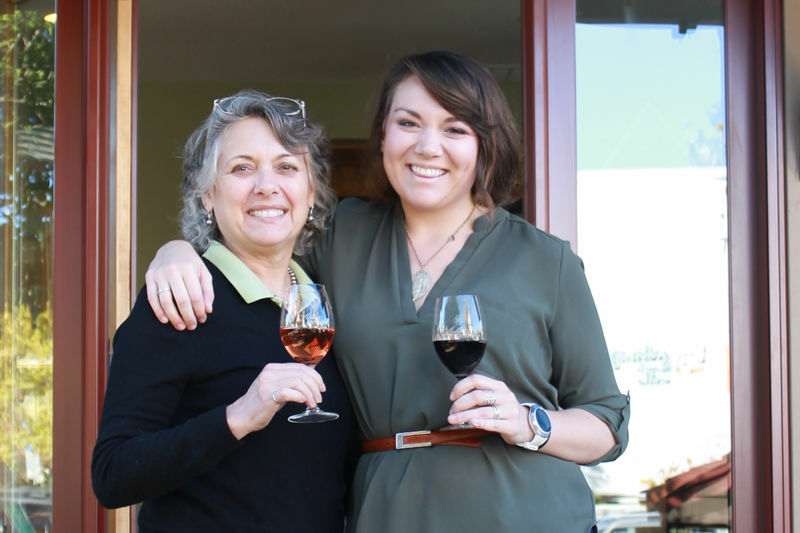 It took about seven months to get the newly christened Kelley & Young Wine Garden Inn up and running, and as part of the operations, they offered wine tastings and wine and food parings, overseen by Kelley Young’s daughter, Madeline Stewart. “Madeline is an educated chef and beverage professional, it’s what she went to school to be, and she came back from school and we started with the blood, sweat and tears,” she said with a laugh. With the inn moving along, and finding herself more enamored with Cloverdale, when she heard about a space next to Pick’s coming available she jumped at the chance. The wood-filled space boasts a long tasting bar decorated with a dark stone top and woven barrel staves underneath and homey, ‘60s era furniture. Stewart greets patrons at the tasting bar, offering pours of the Kelley & Young stable of wines. For now, the food and wine pairings will continue at the inn and next summer they’ll be working with their neighbor David Alioto of Pick’s to offer casual small plates in conjunction with the tasting room, to continue her vision of food and wine coming together. “Food and wine go together like chocolate and peanut butter,” she said.